Later train/bus: Verona 17:16 train to Trento (18:23), 18:55 bus to Ponte Arche (19:43), 19:45 bus to San Lorenzo (20:20). From San Lorenzo (792m) walk ½ hour or take a jeep taxi to Baesa (850m). Walk 4 hours on path 325 via Rifugio al Cacciatore (1820m, lunch) to Rifugio Agostini (2410m). Jeep taxis continue to Rif. Cacciatore. Above Rif. Cacciatore look out for the 10 minute diversion to the fossil cemetery (leads up NW as the path turns left/south). Walk 4 hours on path 320 via Forcoletta di Noghera (2423m), diverting onto path 320b to Rifugi Pedrotti & Tosa (2491m, lunch), then path 318 via Bocca di Brenta (2552m) to Rifugio Brentei (2182m). Scenic walk 2 hours there and back on paths 323 and 305 to Rifugio Alimonta (2580m). Lunch at Rifugio Brentei. 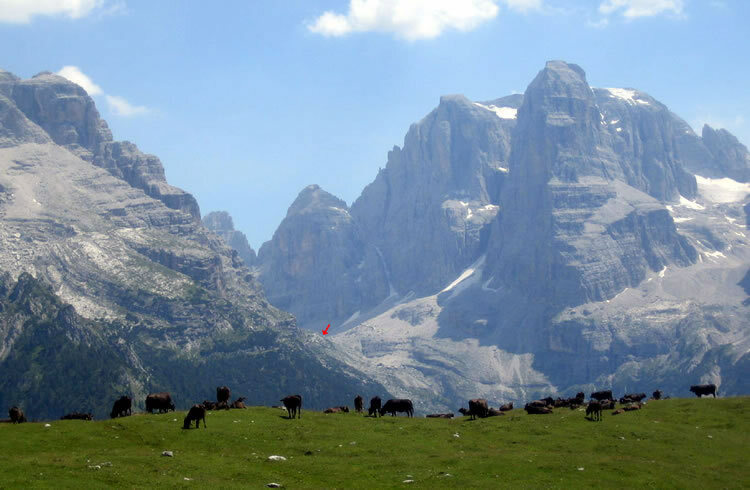 Walk 1½ hours on paths 318 and 328 over Sella del Fridolin (2143m) to Rifugi Tucket & Sella (2272m). Alternative: descending from Rif. Alimonta stay on path 305b (Sentiero SOSAT), easy scrambling, probably 3½-4 hours all told, need pack lunches. Enquire locally - might be too much ice or snow. Walk 1½ hours on path 316 to Passo del Grosté (2442m). Lift down to the fleshpots of Madonna di Campiglio (1552m). Just take a look at the pool at the Lorenzetti! Could walk down to Madonna di Campiglio (1-1½ hours), from Rif. Brentei or Rif. Tucket or Passo del Grosté. Lift back up to Passo del Grosté (2442m). Walk 3 hours on paths 301 and 314 via Malga Pozzol di Flavona (1630m) to Lago di Tovel (1177m). FTM buses from Lago di Tovel to Cles. Longer "official" alternatives: 6 hours via Cima Uomo on path 306 ("tricky", "demanding", max 2400m approx) or 7 hours via Passo Pra' Castron (2505m). Mike/Rebecca: 09:36 train to Verona (10:28), taxi to airport, 13:05 flight LH3945 to Frankfurt (14:35), 16:60 flight LH4856 to Manchester (17:20). Michael: 15:05 flight from Brescia. Wednesday morning Benini 305 Tucket-Grosté 4h, experts only 4h, moderately difficult, well protected 2-3½h Grosté-Tuckett (also 4h), grade d, technically relatively free of problems, sure-footedness, and freedom from vertigo are taken for granted Jagged Globe course notes: "a magical protected easy walk". Tuesday Bocchette Alte 305 Alimonta-Tuckett 5h, experience, freedom from vertigo, equipment 6h, very difficult and exposed, experts only 5½-6h Tuckett-Alimonta (also 5h), grade e, high-alpine traverse, very exposed in places, couloirs with danger of stone-fall and icing, ice-axe and 25m rope recommended Hard but might be possible if Michael is feeling strong.